It seems that Google have had to go out of their way to index these sites. There used to be a hack to get at plain html content, which I used to give as a workaround to users wanting to scan Wix sites, but that no longer appears to work. As someone with a background in website accessibility, this all seems appalling to me*. So... here's my best advice for scanning a Wix site using Scrutiny (Integrity and Integrity Plus don't have the necessary js option). 1. Make sure you have Scrutiny 7.4.1 or higher, which contains some necessary improvements to the js functionality. The most up-to-date version of scrutiny is always here. 3. Turn down your number of threads. You can see I'm using 3 here (first notch). Using the js option is very heavy in terms of client-side processing. 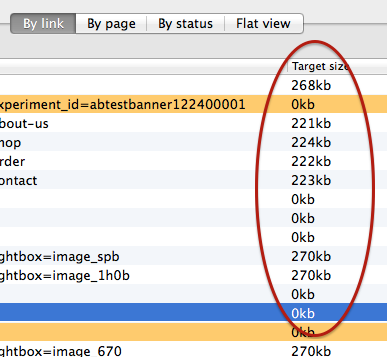 You don't want pages timing out without having loaded because Scrutiny is working hard at rendering a large number of pages. If your website scans fully then maybe edge this up a bit but best to err on the side of caution. 4. Go and make a cup of tea. This is going to take some time. 5. 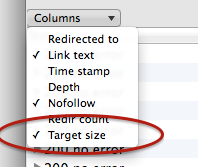 After the scan, switch on the Target Size column of the 'by link' table and check whether any of the Internal links have a target size of zero (switch the Filter button to Internal to see this more easily). 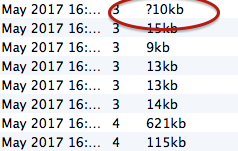 If an internal page has zero kb as the target size, then it may have timed out before the page had finished loading / rendering, which means that you may have an incomplete scan. If that looks well then you're good to go with your data, which should be complete. 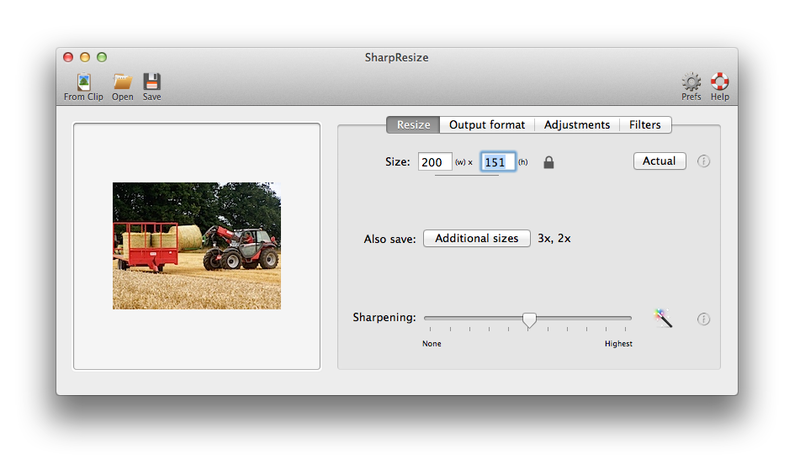 SharpResize v2 is now out of beta. 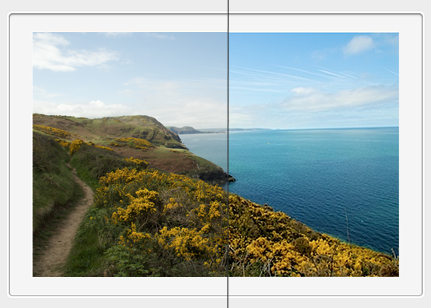 It's a lightweight application (ie quick to start up) for making a better thumbnail / resized for web image. The great result is due to the combination of the resizing algorithm it uses along with an additional sharpening slider. Despite being a lightweight app it now has a good selection of adjustment sliders and built-in filters. (sepia, black and white, posterize etc). We've decided to keep the price down. In fact as it's now priced in dollars (1.95 USD) it's a little less in real terms than the previous GBP price. Alongside our recent post about supporting International Domain names within our web crawling tools, we're very proud and excited to announce that work has started on translating some apps and some web pages into other languages. Initially French, and initially Integrity, Integrity Plus and Scrutiny. It's impossible to do all of the work at once, it will take a little while but the web pages for Integrity, Integrity Plus and Scrutiny now allow you to choose (top-right) English or French versions of the pages. Localized context help in French is shortly to go into those apps, followed by the rest of the text within the apps. The website being scanned was http://peacockmedia.software. 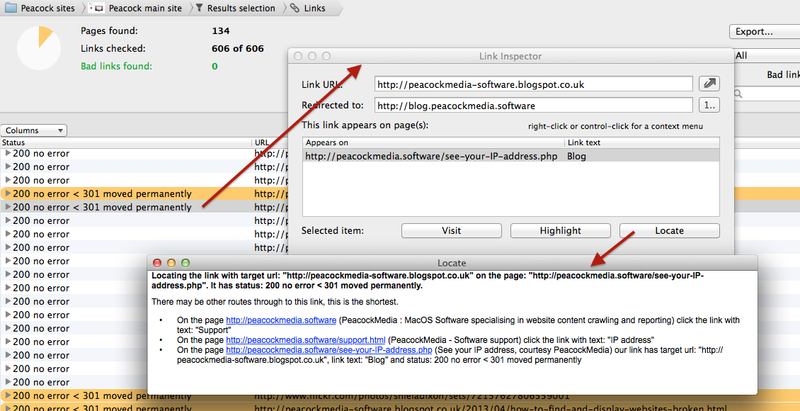 As you can see, the link found during the crawl is a link to a page on peacockmedia.co.uk . That looks like an external link, and so Scrutiny has marked it as an external link, therefore checked its status but not followed it. However, it redirects to a url on peacockmedia.software - so the ultimate destination is an internal one. There are a bunch of pages which will only be discovered if this link is considered internal. The question is - should Integrity and Scrutiny consider that link *internal* (and therefore follow it and discover more internal pages) or *external* (so it's checked but then is a dead end). Remember that the original link is to an external domain. We're a UK-based concern, our apps have been almost always available in a single language - UK English (or just English as we call it here in England!) The vast majority of our users as I write this are from English-speaking countries. Our alphabet entirely consists of characters available in ascii, and so there has been little call for Integrity, Integrity Plus and Scrutiny (and other tools based on the same engine) to support domain names - ie domain names which contain characters not found in the ascii character set. But now we've started work on localisation of our apps and web pages, and have received the odd question concerning IDNs. Let's not confuse this with unusual characters in the path and filename of the url. Our apps have long supported these. You may still see the non-ascii characters displayed, but behind the scenes, those characters are encoded before the http request is put together, usually using a percent-encoding system. The method is similar with the domain name, but using a a more complex and clever system of character encoding. Browsers (and our web crawlers) often still display the user-friendly unicode version. You can enter your starting url in the unicode form or the 'punycode' form and it'll be handled correctly. The same goes for unicode or punycode links found on your pages. Personally, I'm not keen, this does allow for spoofing of legitimate domains using similar characters. There are rules excluding many characters for these reasons. 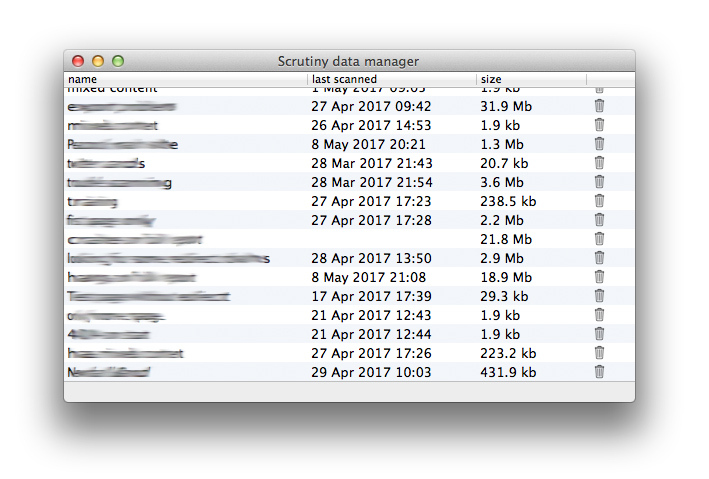 After lots of extra homework for us, Scrutiny is now handling IDNs, and is in testing. [update 26 May 2017] Integrity and Integrity Plus also have this enhancement and are also in testing. 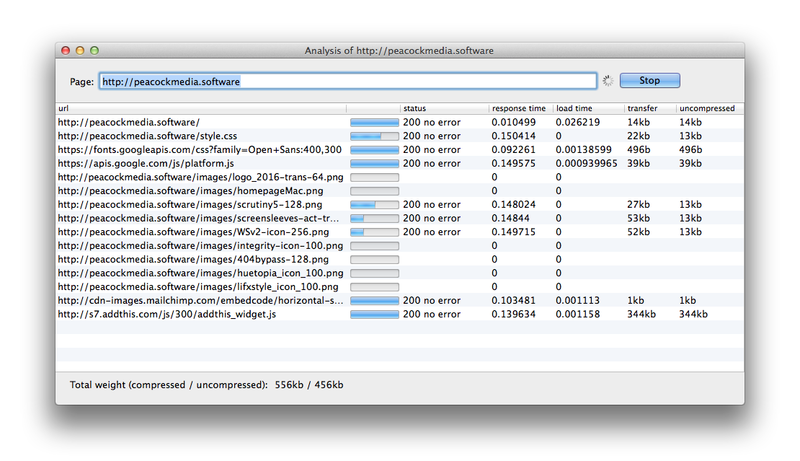 A recent enhancement to Scrutiny and Integrity make it easy to see a list of all images on a site, with file size. The file size was also held within Scrutiny and Integrity, but wasn't displayed in the links views. Now it is. It's a sortable column and will be included in the csv or html export. 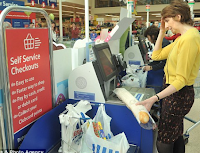 You may need to switch on that column if it's not already showing - it's called 'Target size'. Once it is showing, as with other columns in these tables, you can drag and drop them into a different order, and resize their width. 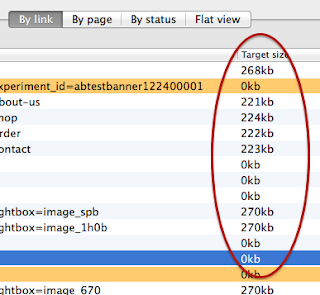 If you're checking other linked files (js or css) then their sizes may be displayed, but will probably have a ? beside them to indicate that the file size shown has not been downloaded and the uncompressed size verified (the size shown is provided in the server header fields). This last point applies to Integrity and Integrity Plus, and will appear in Scrutiny shortly. Anyway. When it doesn't go as planned is when the fun and games start. Today I found myself needing to get back to a customer urgently, but the email address bounced as 'user not known'. Leaving me with a postal address. The old business-letter-writing skills came back pretty easily; my address on the right, their address below and to the left, sincerely if you know their name, faithfully if you don't etc. 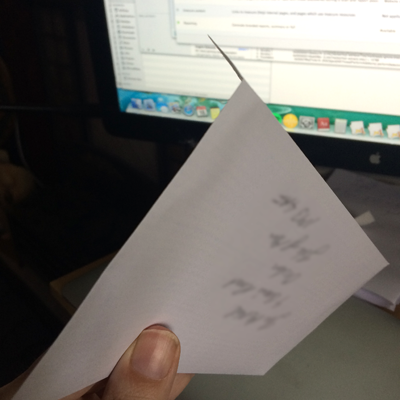 I was wrong to think that it would be quicker to write the address on the envelope than to work out how to print it on a label or put the envelope through the printer. I draw a lot, but I don't write very much at all now. My handwriting was never great, it seems to be appalling now. After several practice goes, I got a result that wasn't as hideous as the first ones. .... then turned it over and found that the address was upside-down! How crap does that look? I'm not going to be among the survivors after the aliens come and hit us with a big EMP device. I've just Googled 'html5 page structure' to check something. The post that appeared first consists of a very simple code snippet followed by around a hundred comments, some asking questions but mostly asserting an opinion. (none spammy or trolly). Without wanting to get very deeply into the actual topic itself (and maybe risking the odd comment myself....) a large number of those comments are about whether a section tag is allowed within an article tag and vice versa. It seems that anything goes as far as these two are concerned. But my, don't we love rules? It reminds me of those areas of cities where the pavement and road have been paved over into one homogenous area. I hate them; surely it's better if there are rules that everyone knows? This tip applies to Integrity, Integrity Plus and Scrutiny. So the app is reporting a broken link (or maybe it's a redirect you're interested in, or just a good link). 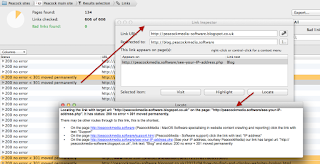 You can easily see, copy or visit the target of the link, or the page it appears on. But how did the crawl find this particular page? The Locate function will tell you. First open the link inspector by double-clicking on the link in one of the Links views Then highlight the 'appears on' page you're interested in, and click 'Locate'. It won't show you every possible route to that link, but it will show you the shortest. note that there's a context menu there too with these options. 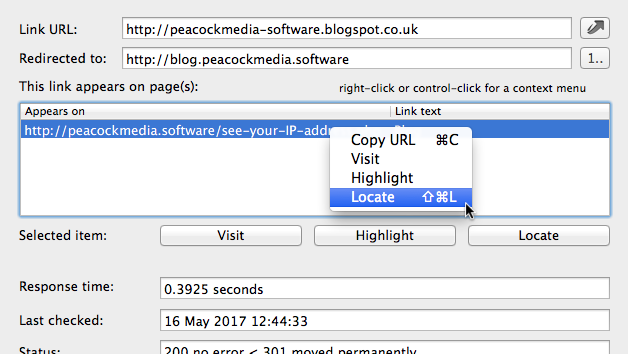 You may have noticed that the link inspector and the context menus have a 'Highlight' option too. If you're having trouble seeing the link on the page, the Highlight option will do its best to open the page and apply yellow highlighter. [Edit 14/6/17] this bundle has now finished. 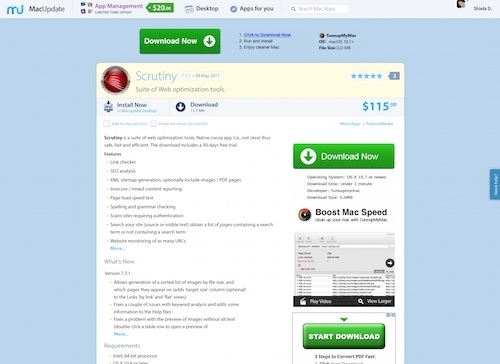 Bundlehunt have just gone live with an offer that includes Scrutiny. The Scrutiny licence is the full per-user licence for the current version, 7.3.1, usually $115. Improved insecure content reporting - the table now shows all issues - secure pages which contain links to insecure ones, and pages with mixed content. 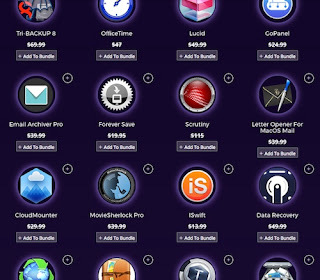 Manage the autosaved data and selectively trash what you don't need. 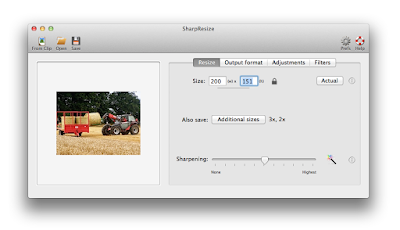 This article uses SharpResize and is updated for version 2, which creates better thumbnails. Version 2 is available shortly as beta. There are several ways to get your image into SharpResize. Tip: You can grab an area of the screen using cmd-ctrl-shift-4. Drag a rectangle and see the width and height of your selection. It's not an easy shortcut to remember but worthwhile. In addition there are toolbar buttons for New from Clipboard, Open and Save. A note about retina screens. This is a confusing subject, pixels can refer to the number of dots within an image and the actual physical pixels on the display, or it can be used as a a measurement similar to points. Because SharpResize is designed primarily for resizing images for the web, it will display your image at '1x' - ie the size that it would appear if you specified your size in pixels in a CSS. If you're using a retina screen, then this would obviously look fuzzy and you wouldn't be able to make proper judgement when making adjustments to sharpness etc. As it says, the 2x version of your image will be displayed while you're working. This setting should be auto-detected when you first run SharpResize. 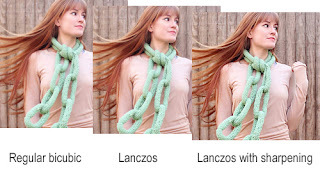 If you want to save the actual version of the image that you're seeing while you're working, make sure that you have 2x selected in the Additional sizes. When you open a new image, the width and height won't immediately set themselves to the size of your image because Sharpresize is about creating thumbnails, and the width and height fields may be set to the size that you want your thumbnail to end up. If you want the resized image to have the same aspect ratio as the original, make sure the padlock is in the 'locked' position. If the padlock is in the 'unlock' position, then you can set the height and width to whatever you like, and you'll see additional controls relating to whether you want to crop your original image to size or add white, grey or black etc. 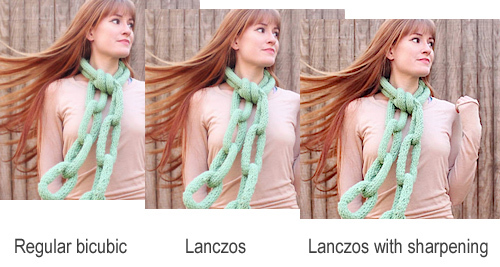 Resizing will be performed with Lanczos sharpening which is noticeably better than the more usual bicubic. You will see the output image displayed in the image well. The Sharpening slider applies a further filter to further improve a resized image. Use judiciously - too much will result in an artificial look. The best setting here will depend on the image. Most pictures seem to look best with the slider about a third of the way. If the image includes text, any more than a small amount of sharpening can spoil the anti-aliasing and make the text look jagged. 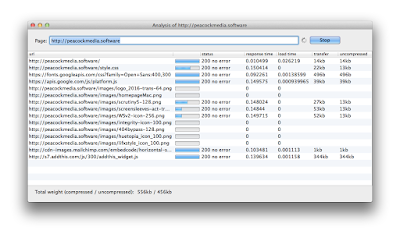 Under the Output File tab, the Quality slider sets the jpeg compression of the output. (If you have the jpg output file format selected.) For maximum quality you'll also get the maximum file size but the file size can be reduced significantly (maybe halved) by backing off that slider a tiny bit below maximum. 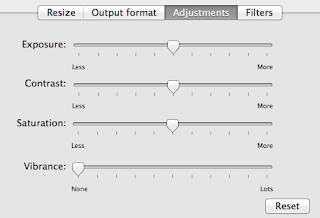 Version 2 has more controls for adjusting the output image, and also a few filters, such as Sepia and Black and White. Like a little extra vibrance with your sharpening? No problem. The height and width fields are important, they'll set the dimensions of the primary output image for all input images. 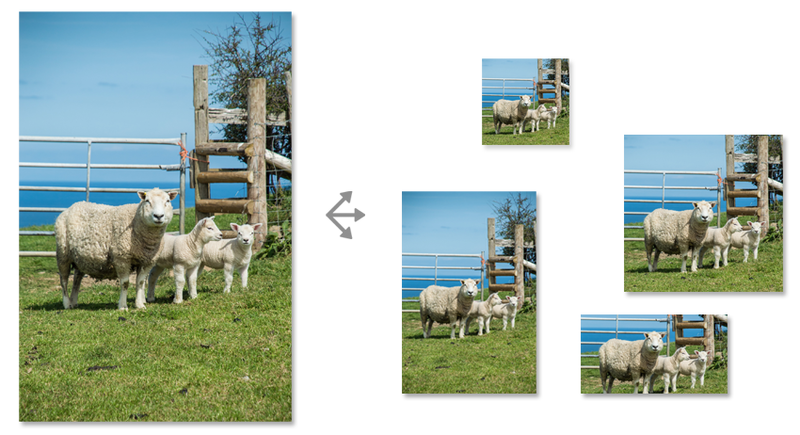 You can now create and select additional sizes (for example, a banner-format image, or a square image, or a @2x image). These can be relative to the original image size, or your primary output image, or have absolute dimensions. 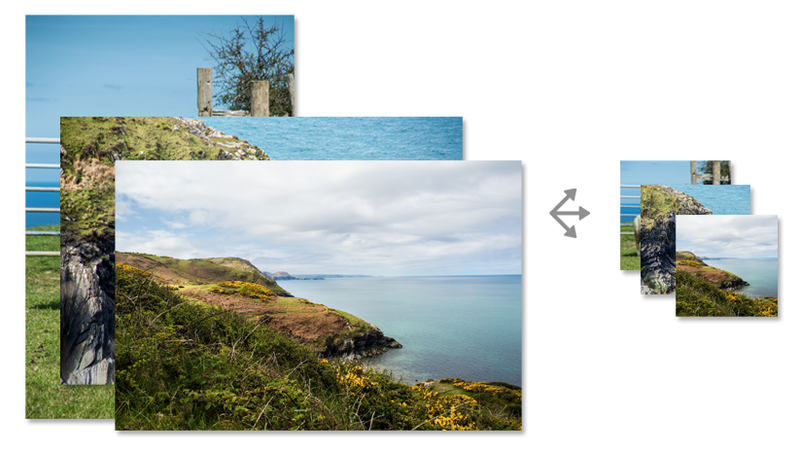 Version 2 allows you to drag and drop or open multiple images. They'll all be resized using the height and width that you've set and all using the same sharpness and adjustments that you've set. 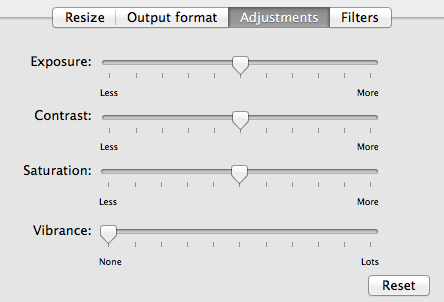 if you've created and selected additional output sizes, each input image will be saved with all output sizes. You can save the image using File > Save, cmd-S or the toolbar Save button. If you have opened multiple images, you will be asked to choose a folder for the output images (at least one output image for each that you've opened). Files will be saved with their original names. If you've chosen additional sizes for each image, the filename modifier will be applied. There's a preference to set whether SR saves all of these images directly in the folder that you've chosen, or whether it creates a new folder with a unique name and saves the images within that. The latter method is set by default, and is less likely to cause filename conflicts. If you have opened a single image (regardless of how many output images you want) then you'll be asked to choose a filename, and your output images will be saved with that filename, with modifier where appropriate. Do people really fall for those headlines? Surely we're all aware by now that anything that sounds too good to be true always is. And that if you ever do take the plunge into that clickbait labyrinth and ever do find the promised information, it's sure to disappoint. When I say funny, I do find it sad that it's reinforcing and preying on fear and anxiety. The funny part is the '4Idiots' part. I can almost understand how the 'for Dummies' series works, people are often self-deprecatory when it comes to technical things. 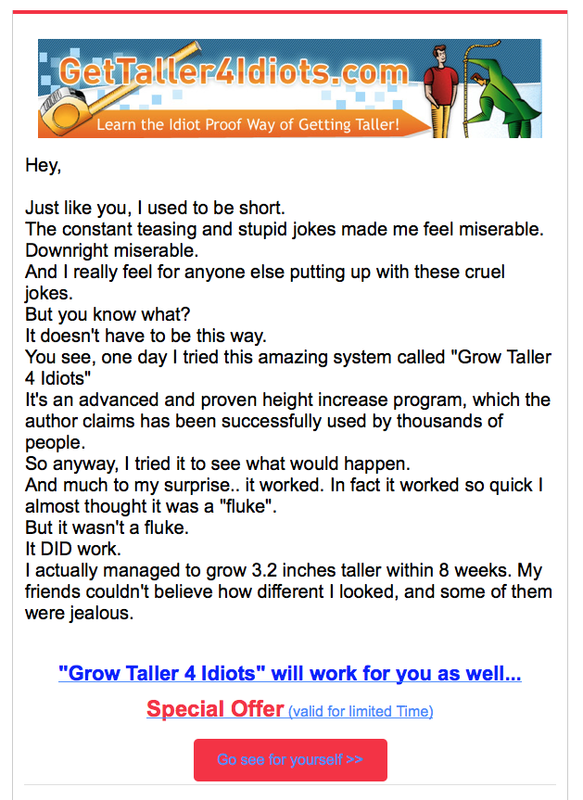 But what man with anxiety about his height is going to click a link that says 'for idiots'? Anyway. 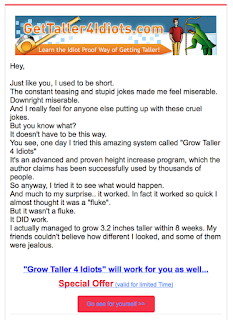 You clicked a 'one weird trick' link and arrived here. Maybe it's not an empty promise this time; we're responsible for Scrutiny, which can quickly scan your website and report broken links, SEO issues, spelling and much more. Scrutiny is the premium product. For no-frills link-checking, there's the free Integrity, and for more features, it's paid sister Integrity Plus. Too good to be true? The paid apps offer free trials, so you've nothing to lose by finding out. This may be Scrutiny's coolest trick (other than its main job of zipping through a website like a dose of salts and presenting loads of data). It may not really be a hidden gem, because it's mentioned in lots of places and one of the main new features of version 7, but if you've just downloaded Scrutiny and run it, you may have missed it. 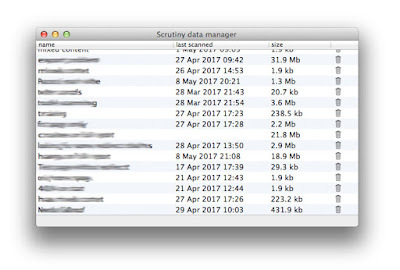 As the title of this post suggests, Scrutiny 7 allows you to open multiple windows and scan a site or do anything else you like within them, examine some data or configure the settings for another site. Unsurprisingly, File>New (cmd-N) will open a new window for you to use as you see fit.